"loquat." YourDictionary, n.d. Web. 18 April 2019. 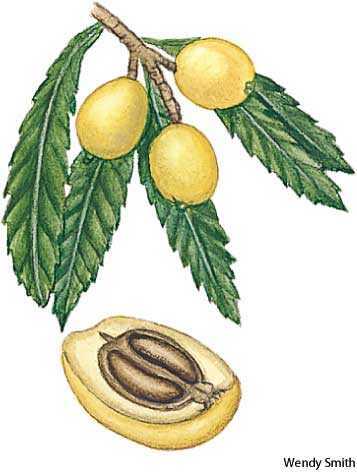 <https://www.yourdictionary.com/Loquat>. A small evergreen tree (Eriobotrya japonica) in the rose family, native to China and Japan, having fragrant white flowers and pear-shaped yellow fruit with large seeds. The edible fruit of this plant. The fruit of this tree. It is as large as a small plum, but grows in clusters, and contains four or five large seeds. From Chinese Cantonese trad. è˜†æ©˜, simpl. èŠ¦æ©˜ (pinyin: lou4 gwat1) (older word) Related to kumquat - same second character. Chinese traditional medicinal remedies: Taking yin chiao (sometimes transliterated as yinquiao) tablets that contain honeysuckle and forsythia when symptoms appear as well as using natural herb loquat syrup for cough and sinus congestion. E. japonica: Loquat (Eriobotrya) - A large-leaved shrub from Japan; in England tender, and only suitable for walls in warm and sheltered places. Its very large leaves are like those of the Loquat, and are of silvery whiteness. Among fruit trees, besides the wild fruits already mentioned, are the pineapple, mango, papua, guava, grenadilla, rose apple, custard apple, soursop, loquat, naartje, shaddock and citrous fruits. Of these the apple and the pear are now very inferior in Corfu; the others thrive well and are accompanied by all the fruit trees known in southern Europe, with addition of the Japanese medlar (or loquat), and, in some spots, of the banana.